"You'll Believe That Pigs Can Fly!" Isabel Green’s life is spiraling out of control as much as her hair is curly and frizzing. She’s a kindhearted young mother of three assisting a bungling elderly lady in a village shop to try and pull together the funds necessary to hold onto her husband’s family farm while he’s away at war. Her brother-in-law Phil Green owns half of the farm and is quite keen to sell it. He is forever scheming to convince Isabel to agree with him and sign the papers for the sale. Isabel’s children are just as determined to keep the homestead and are doing their best to manage the farm work without their father. Tensions escalate when their high-brow cousins Cyril and Celia arrive from the city for a first-time visit a day earlier than planned. The Green children stop their work and stare as the cousins’ chauffeur-driven car pulls up into a sea of barnyard mud. It isn’t long before all of the children are at each either and the persevering Isabel is at the end of her rope. She finds herself in desperate need of some help and relief. Assistance arrives in the form of Nanny McPhee who appears on the Green's doorstep one evening in the midst of a storm. As she steps inside, Nanny McPhee is just in time to witness the cousins fighting. In a firm moderate tone of voice she tells them to stop and when they ignore her instruction, Nanny McPhee resorts to the use of magical persuasion to teach them Lesson Number One. There are four more lessons to follow. Nanny McPhee uses the children's relationships and her magic stick as teaching tools to help accomplish the goals. She also steers the outcome of their many adventures to assure that they will learn all of the lessons well. 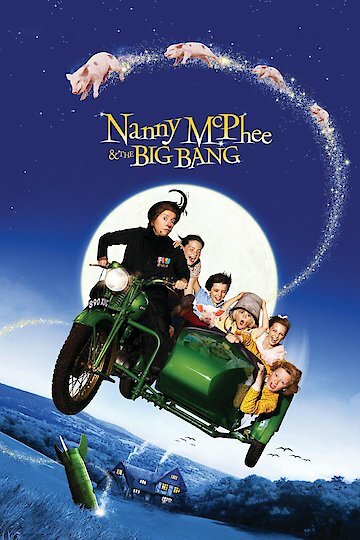 Nanny McPhee Returns is currently available to watch and stream, download, buy on demand at HBO NOW, Vudu, Google Play, FandangoNow, iTunes, YouTube VOD online.